The Chevrolet lineup was carefully designed to meet the needs of any driver looking for a truck, whether you need a pickup for work and just have a passion for trucks at heart. 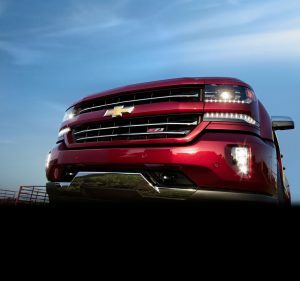 From the Chevy Colorado to the heavy-duty Chevy Silverado models, there’s something for everyone. The standard 2018 Chevrolet Silverado is a moderately sized truck that still manages to get an excellent 24 miles per gallon on the highway, with 420 horsepower and the ability to tow up to 12,500 lbs. The Silverado 1500 is a smart way to dip your toe into the world of serious pickups. Similarly, the 2018 Silverado 2500HD is comfortably sized, but it’s also pretty powerful. In fact, this model produces 910 lb-ft of torque, has a maximum payload of 3,534 lbs, and can tow up to 18,100 lbs. If you’re looking for a powerful model for the right price, the Silverado 2500HD might be the answer. Finally, for serious jobs, there’s the 2018 Silverado 3500HD , a beast of a pickup truck that also produces 910 lb-ft of torque, has a maximum payload of 7,153 lbs, and can tow up to 23,300 lbs. If you need a truck that can be relied upon for any job, then the Silverado 3500HD is for you. The new 2018 Chevrolet Colorado is the ideal truck for the modern driver, offering all the perks of a truck bed, powerful performance, and more, while maintaining excellent fuel efficiency (30 miles per gallon on the highway) and without overdoing it on size. For day to day trips, the Colorado is the perfect fit. If you would like to learn more about any of these Chevrolet trucks, or if you’d like to take one out on a test drive, give us a call or don’t hesitate to stop by and visit anytime, here at Landmark Chevrolet in Randolph, NY!